Dublin Fringe Festival has kicked off packed with loads of exciting new projects to see. Bunk was the one I personally was really waiting for – after seeing Ether Production’s performance I fell in love with an idea of aerial circus, so mesmerizing. I wasn’t the only one judging by the booked out night. As I got into the auditorium, it seemed that performance had already started, even though initially I really thought that someone was just checking on the equipment. Lights were still on as people settled down in their seats. After a while the usual Project Arts Centre announcement on filming, photography and mobile phone usage followed, which I thought was very smartly done – twisting the voice to make it more surreal in accordance to the darkish atmosphere that dominated the entire performance. The main idea of the act lies in sleeping – we dream colourful dreams, vivid dreams. Sometimes they are reflections of happy moments, at times though an anxiety leads the path instead. It’s an unpredictable journey we take on every night. 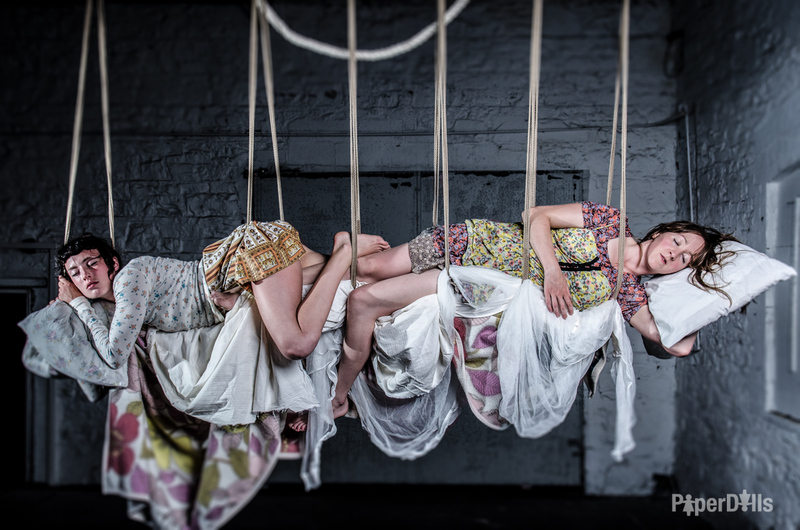 The show concentrates on a darker side of dreaming – nightmares. Thoughts create illusions. When we dream, our imagination goes wild, there are no limits and as pleasant as the experience can be, it can also be frightening. At times influenced by day to day events, at times just an uneasy mind playing with our adrenalin levels. I am sure every single person has had a dream, where someone was chasing them. This concept is also present in Bunk. That feeling of hopelessness, when you can’t run away, no matter how fast you run. Or maybe you have had a dream that someone is trying to pull you down? Don’t worry, PaperDolls have that incorporated in their performance too. The question is – are you giving up in your dreams or are you fighting the dark side? Playing with light, sharp objects, despair and constant move reflects the experience of visiting shadows of the ‘snoozy land’. As kids we were often afraid of them, but do we really ever learn how to fight our fears at times, when we are most vulnerable and we are against the strongest enemy there is – our own mind? Bunk makes you think – are you really safe when you are left alone with your thoughts and can sleep make you even more tired? Setting of the scene is symbolic – a giant bed. The bed you fall into at the end of the day and the bed where your imagination unleashes the power of taking you to places of your mind you never knew existed. The chosen concept was very interesting, however I thought it required further work and further development. Had I not done my research after the show, I wouldn’t have understood ideas behind it. On the technical side of it – while I thought some touches were smartly incorporated and were very well done, it lacked the WOW factor. Perhaps the stage could have been used to the greater extent or there could have been more acrobatic elements incorporated in it. It was not my favorite, but I appreciate the effort that went into it, knowing how difficult it must be to stage and perform such a show on a physical level. Verdict: Interesting concept that hopefully will get some further development.